Casually, I strolled into the store, and without hesitation snatched a book from the shelf and began offering a sarcastic commentary as I read from the pages. I noticed my wife growing uncomfortable and so I placed the book back on the shelf, and proceeded out of the store. Suddenly, a dull sensation hit me. It began in my stomach and shot upward through my head, impacting my equilibrium. As I stepped outside, into the main mall walkway, my head started to spin, my hands started shaking. I felt as if I was going to faint. It was literally as if an invisible terror had “jumped” on me, and was somehow injecting powerful feelings of nausea and anxiety throughout my entire body. I tried shaking it off, but couldn’t. I attempted to walk it off and failed. At last, feigning interest in something, I moved away from my wife and began to pray. I asked the Lord to forgive me for my sarcastic attitude, my lack of caution, and for my want of concern for the lost. I prayed for deliverance from evil and for healing of the body and mind. After several hours of such walking and praying, I was finally restored. I discovered a valuable lesson that day: while a Christian may not be demon-possessed, it’s equally true that the “princes” of this world are powerful, and we should enter their arena only after prayer, and at the prompting of the Lord. I also learned the mystical forces of the New Age movement are genuine (and willing to protect their territory! ), and that much of what is currently published under the guise of New Age “enlightenment”, is nothing less than Old Age doctrines of nefarious invisible hosts. As in antiquity, so in modern times, those who practice paganism are guilty of worshipping “devils” (Rev. 9:20). The dogmas which were once embraced (and still are through the New Age Movement) as the wisdom of the gods, are defined in the scriptures as the “doctrines of devils”. The Apostle Paul declared: “the things which the Gentiles sacrifice, they sacrifice to devils” (1 Cor. 10:20). In Acts 7:41-42 (Jerusalem Bible), we find that those who worship idols are joined to the “army of heaven” [stratos, the “fallen angel army”], and Psalm 96:5 concludes that “all the gods of the nations are idols” (elilim, LXX daimonia [demons]). Thus, pagan images, such as represented the ancient gods and goddesses, were elilim (empty, nothing, vanity), but behind the empty idols were the living dynamics of idolatry, and spiritual objects of heathen adoration, the daimonia (demons) of the Bible. One also concludes that the images of the gods (falcon headed statues, animal forms, etc) served the purposes of such spirits by providing a point of focus, and by revealing the “nature” of the particular spirit existing within the god. The iconographies, myths and rituals of each deity exhibited the specific characteristics (nature, gender, underworld authority, etc) of that particular entity. Thus, the myths and images of Zeus, according to such theory, were the physical manifestations of a literal demon of air, while statues of the goddess Demeter represented an earth spirit. Today, it is my assertion and the claim of my book THE GODS WHO WALK AMONG US, that the same spirits of antiquity, including Zeus, Athene, Dionysus, and others, continue to express themselves within modern paganism. My co-author, Dr. Jones agrees, asserting that the connection between the New Age Movement and the gods of mythology is strong. Paganism in America is exploding as we enter the new millennium. Throughout Hollywood, government, cyberspace, and even the church, the masses are embracing the religious philosophies of the New Age of Aquarius. An amazing component of the New Age Movement (as verified by such examples as my friend, Judy) is its capacity to adapt to a variety of religious, even Christian ideas. Consequently, many of the popular “Christian” doctrines advocated today are nothing more than the cultic propositions of Eastern mysticism and ancient paganism. These include concepts of psychic healing, self-realization, emotional experiences, rules of success, breathing techniques, positive confession, name it and claim it, environmental theology, the ecumenical movement, visualization, hypnosis by clergy, mind manipulation, and so on. At times, and I say this with caution, even the activity within the “fundamental” church, including certain physical phenomena we sometimes embrace as the miraculous evidence of “revival,” is a modern form of magic and opens the door for “old gods” and their mysticism to invade the church. The line between a true manifestation of God, and human orchestration, is often blurred. Sincere people, in a quest to experience God, frequently mimic the doctrinal and physical activity of others. Some physical phenomena (crawling on the church floor and making animal sounds, etc) is extra-biblical in nature (not everything that is extra-biblical is un-biblical, however) and therefore undefined by New Testament teachings. As a result, some Christians have been drawn after mystical experiences rather than concentrating on God and His Word. Even sermons preached by well-meaning ministers have tempted Christians to pursue “supernatural” encounters with “God”, rather than instructing them to live by faith. The danger of such undisciplined sincerity is that human nature rarely limits its opportunity for experience. If the Bible has no clear guidlines of conduct and order, and the activity is being promoted by church authorities as a way of experiencing God, then the person seeking the “experience” may have trouble defining what is, and what isn’t acceptable, and thus go too far. For emotional people the “experience” may be expressed by a physical reaction, while academics tend to interpret mystical “experiences” with God as divine revelations or imparted knowledge. The dangerous consequences of such conduct often leads to religious behavior more reminiscent of Dionysus or Apollo worship than of New Testament Christianity. As a result, people like Judy Vorfeld start out in a Christian church and wind up in the New Age movement. I echo Samantha Smith’s concerns. The gospel according to the New Age Movement is an expansive idea centered around the birth of a new world “consciousness.” As a religion of monism (all is one), New Agers hope to accomplish what the builders of the Tower of Babel failed to unify the masses of the world under a single religious umbrella, and, at the macro level, harmonically converge the world’s energies with the power of Gaia. To promote such goals, New Agers claim that God is pantheistic (God is all and all is God) and that humans are divine members of the whole “that God is.” According to New Ageism, Jesus came to reveal this pantheistic nature of God and to teach humanity the gospel of Self-Realization. After illustrating the divine principle of “God within us all,” Jesus ascended to a place of distinction to live among the Masters of the Spiritual Hierarchy - Buddha and Krishna. Jesus promised that the essence of God would be revealed from time to time, and thus New Agers look for the imminent appearing of a World Teacher who will, as Jesus did, illustrate the divine human potential. In this way, New Age theology prepares the world for the coming of the False Prophet and the Antichrist. Pagans claim such a religion of Self-realization - a belief that will be championed by the Antichrist - is older than Christianity. The gospel according to the New Age Movement - a gospel of becoming god is as old as the fall of man. It began when the serpent said to the woman “ye shall be as gods” (Gen. 3:5), and it will zenith during the reign of the Tribulation god-king. 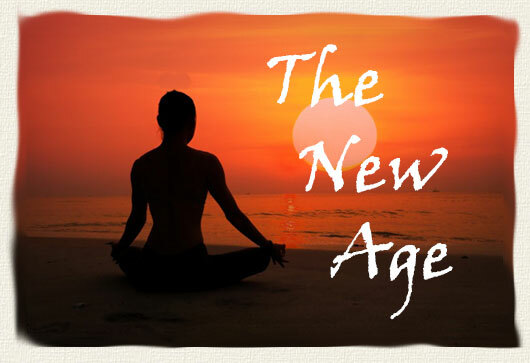 The New Age movement provides the perfect creed for implementing such an end-time religion. It unifies the religions of the world. It consecrates the forces of nature. It provides for human divinity, and it is vogue, post modern, and politically correct. Thus, history repeats itself, and the ancient Egyptian gospel of men becoming “gods” is fashionable again! As a businessman and ministry leader I’ve tasted the bitter results of the “new age” segment of Christianity. Too often these believers fall, flop, quiver, shake, and gyrate on Sunday, but can’t get out of bed and go to work Monday morning. Among such employees, I’ve found insignificant character differences between religious groups, and “Christians” have been just as likely as non-believers to lie, cheat, and steal at my place of business. Perhaps I’ve been unlucky, or maybe, as I believe the case to be, twenty years of popular New Age metaphysical focusing on “self” has so impacted this generation that many “Christians” are willing to dilute their character to acquire what pleases them.